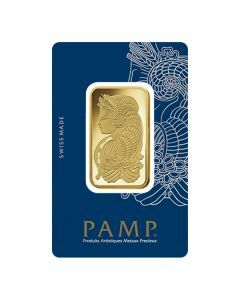 This 1 oz gold bullion bar features the latest design launched by PAMP Suisse, a respected precious metal refinery company based in Switzerland. It is a highly trusted brand in the world of precious metal products due to their extraordinary quality standards. PAMP Suisse is a globally recognized name that investors hold in high regard due to years of fine quality and excellent purity of precious metal products manufactured by them. It was established in Ticino, Switzerland as a refinery and now is a part of the MKS Group based in Geneva, Switzerland. Each bar is minted from 1 ounce of 0.9999 pure Au (Gold); moreover, this purity, weight, and the authenticity can be verified by matching the serial number of the bundled Assay card with the serial number stamped on the front of the gold bar. The familiar PAMP logo is seen imprinted on the top of the obverse of this mint gold bar; this is followed by the word ‘Suisse’, the weight of the bar ‘1 Ounce,’ and the purity of the gold ‘Fine Gold 999.9.’ Underneath the purity, the assay mark reading ‘Essayeur Fondeur’ and the unique serial number of the gold bar are imprinted. Gold bullion bars have been sought after by investors for decades, due to their reputation as the best way to invest in a commodity that appreciates in value with minimal downward fluctuations over the long term. 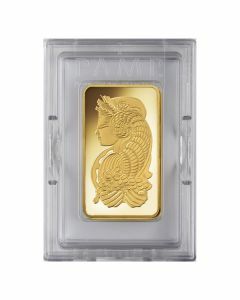 This 1 oz gold bar is a perfect purchase for those who want to kick off or diversify their precious metal investments. The small size and relatively low weight of these gold bars make it an ideal approach to kick-starting your gold investment campaign.